My college classes are spread out over three days of the week, but the work never ends. I went up to the Studio for a few hours in the afternoon yesterday (my internet was down last night so I couldn't post this then) to take advantage of my big work table for some school related projects. One thing was to grade the charcoal drawings that my students turned in last week. It's not that I couldn't grade them at home, but charcoal is messy, so I figure it's best to keep that out of my apartment. However the big project was to do some ink wash drawing for a demonstration. All my students have drawn with pencils before starting my class. Some have worked with charcoal, but even for those who haven't, the procedure is pretty obvious. Most have never worked with ink and brush before, so that's why I make extra preparations. 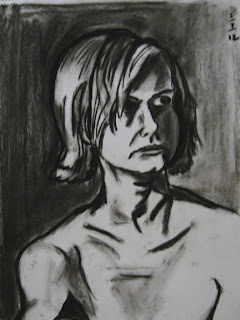 I teach them to work gradually from light to dark, to build the values with layers of gradually darkening washes. I can show them completed wash drawings (slides and drawings on paper) but that doesn't show the progress. I could demonstrate it in class from start to finish, but that would take up most of the class period. So instead I did the step by step ahead of time. I chose a recent charcoal portrait, picked up last week from the recent show in Belmar, to use as my subject. I used Molly's homemade light table to trace the basic composition with pencil three times in an 18" x 24" pad, the same brand sold at the college's store. 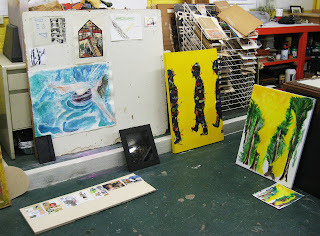 I refined the pencil shapes back on my Studio table, and then made three wash drawings in various states of completion. The first was just a layer of very light wash and a few bits of second layer. The second drawing had everything the first did, but then I took the whole thing a step darker, so students will see the white of the paper, a light wash, and some darker areas. The third drawing has all from the first two, but I took it still darker, so that a more full range of value is shown. I photographed the last one at all three states for the eventually online posting, but I'll use the three pages of drawings in class as part of the demonstration. Got the news tonight that I'll have a piece in this year's 8th Annual Jersey Shore Juried Art Show at the Belmar Arts Council. I have submitted the above piece to this show at least two other times, but each time it wasn't selected. Not a problem, since each year I submitted two, rules only allow one accepted piece per artist, and my other piece was always accepted. Another rule is that a piece that has been shown before at the Boatworks can't be submitted. I don't have a problem with such a rule, since my policy is also to never show the same work in the same location twice, but there is the issue that I have very little recent work that hasn't been shown there yet. So I decided to put forth The Floating World: Wheel Game one more time. 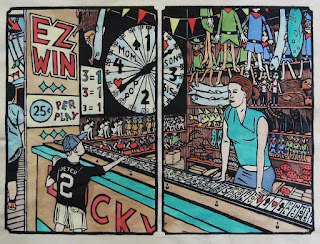 It fits the above mentioned rules, and it's one of my favorites of the boardwalk prints. Because this past Friday ended up being so busy, I didn't have time to frame anything else, so for the first time ever I submitted only one piece to this annual show. You never know how these things will go (we always go with an outside juror), but the gamble paid off. The opening reception will be Saturday, April 7th from 5:00- 7:00 pm. 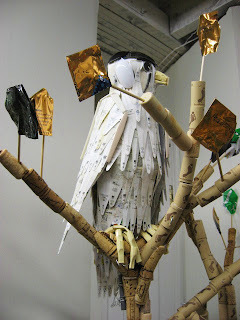 The exhibition will remain open through May 4, 2012, Wednesday to Saturday, 1 to 5 pm. Admission is free. 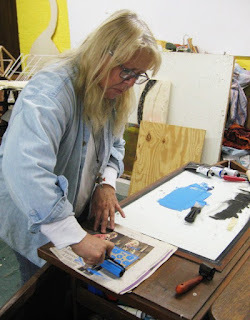 It was last May that Carol Bernard first spoke to me about her plans for the Creativity By the Sea art festival, which would arrange for local artists to teach workshops all around the town of Ocean Grove. Organization started in September, and by December I was committed to a date and time and began to prepare. Over the last few weeks I spent a lot of time shopping for and purchasing necessary materials for the workshop, only learning that I had a relatively full class last week. Yesterday afternoon, Molly and I gave the Studio its most thorough cleaning in quite a while. As for the class content, no special preparation needed. 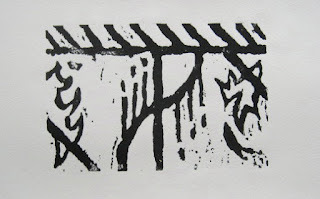 I've never taught linoleum printing before, and am not used to working with students who are more oriented toward crafts than fine art, but I know relief printmaking and figured the rest would follow. There was an opening reception last night at one of the traditional inns in Ocean Grove and I decided to go. About 50 people were there, a mix of organizers, instructors, and students. I met two of the women who would be in my class, and chatted with some local arts people I know. There was still some uncertainty about the number of students in my class. It was five, with the possibility of a sixth, then it was down to four, then last night back up to five. Some of the planned classes were cancelled for lack of participants, so I felt good about getting close to my maximum. I arrived at the Studio this morning around 9:30, and by 10:00 my students had arrived, coming from as close as Red Bank and as far as Connecticut (some having spent the night in town at local inns). The student who was on and off the list didn't show, but four is still a good number for a class like this. 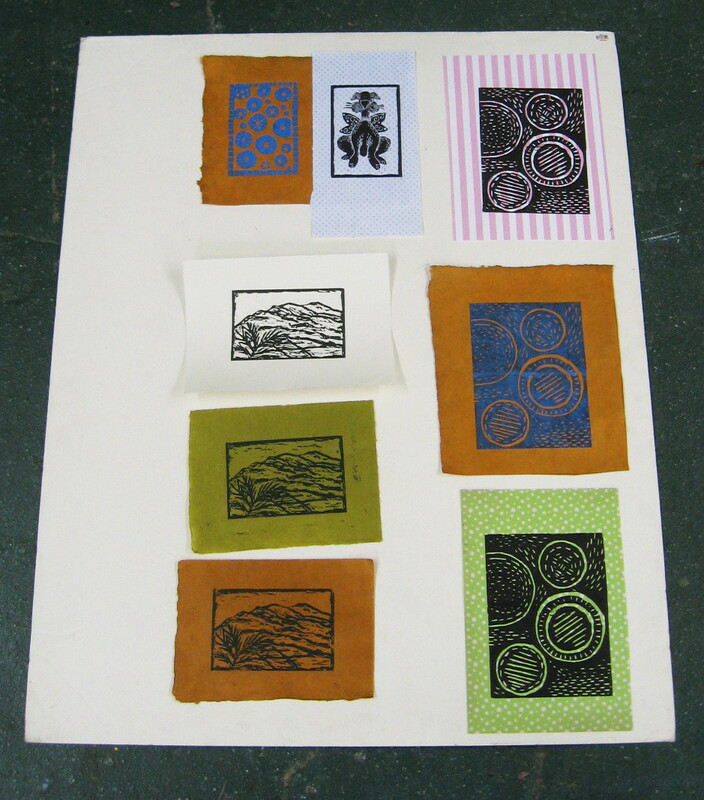 I started as I do with my woodcut workshops, showing prints from my collection. 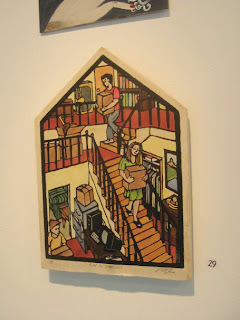 Due to the nature of the crowd, the emphasis was on prints that used relief and collage, as well as unusual materials, pulled mostly from my collection of group folios, as well as a few of my own. 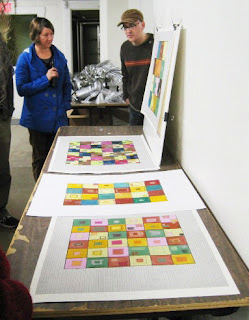 After that, I distributed paper, pencils, and markers, as well as the linoleum pieces (above), and let them start working on ideas. 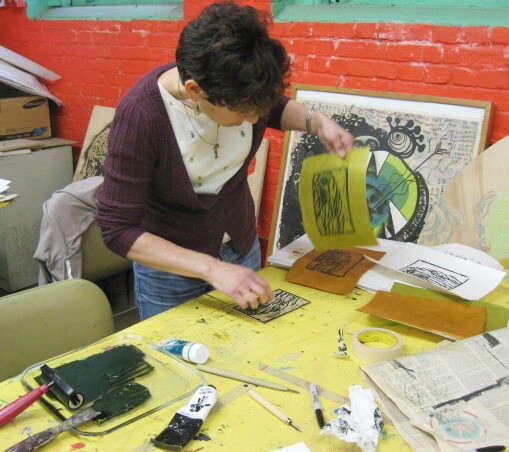 They started with paper sketches, then drew their ideas onto the linoleum. Since they seemed ready to cut, I gave a quick demonstration of how to use the tools safely. 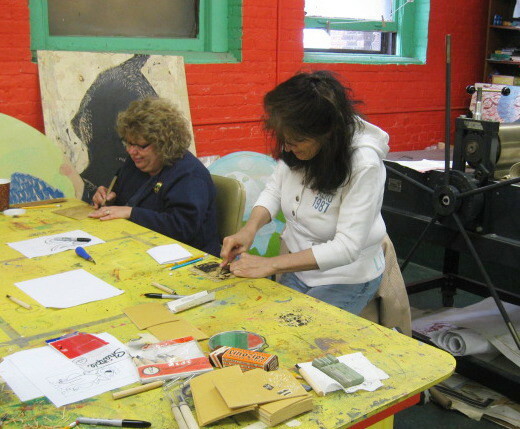 I handed out a mix of standard linocut tools, some really cheaply made woodcut tools (never good enough to cut wood, but with some quick sharpening, acceptable for linoleum), and even a few of the better student woodcut tools I bought for my workshop in Belmar last fall. Two of my students just did one block. 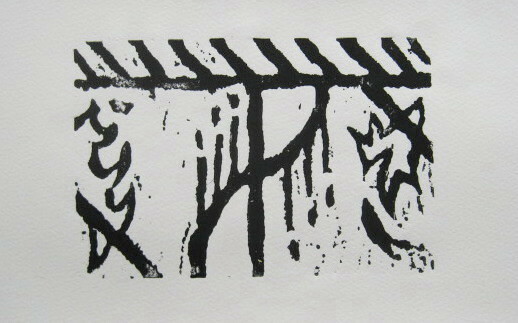 One did two blocks as separate prints, and one came up with a design to put two side by side to make a larger piece. 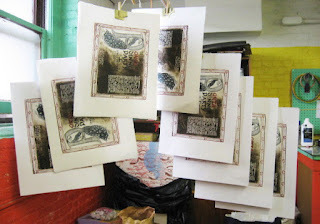 Two took a lunch break, the others worked straight through, and they were all ready to try printing by around 2 pm. I had brought a wide variety of papers (top), ranging from traditional western printmaking paper, to a variety of decorative traditional papers, to inexpensive scrapbooking paper in a variety of patterns. 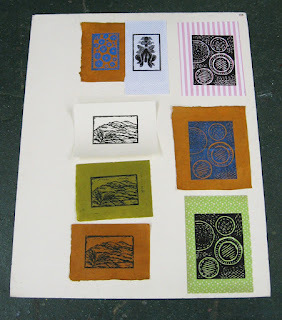 Some printed with black, some mixed specific colors, like the special blue that Susi used on one of her blocks. 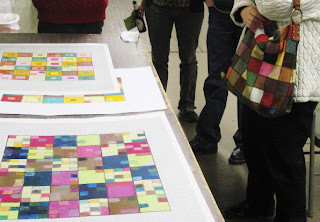 I showed them how to roll out the ink to the right consistency and ink their blocks. 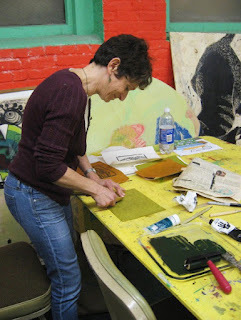 Above, Jodi hand prints her block onto Lama Li paper using a custom mixed dark green ink. 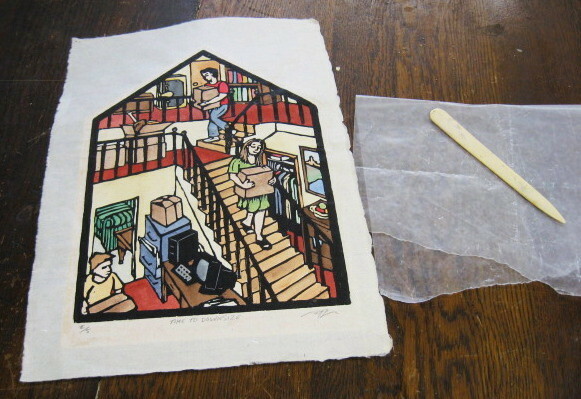 Below, she lifts the resulting print off the block. Eileen (above) dabs some ink on a finished print to cover the hairline gap between two printed blocks. 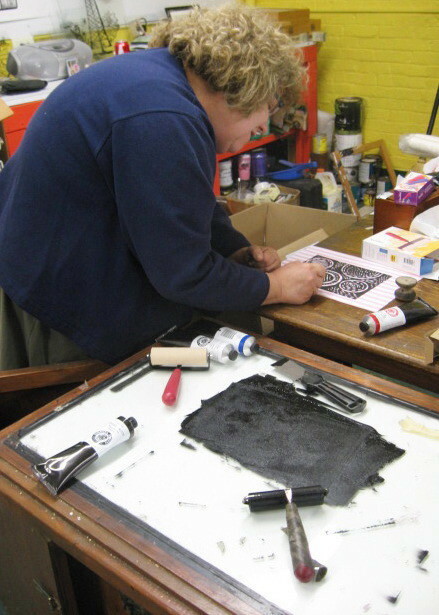 By the end of the day, everyone had finished at least one print and had demonstrated the ability to do the process from start to finish. Some were done on standard white paper, like the above print from Vicky (she plans to experiment with adding color later). Most of the prints were pulled on various color paper (below- click to enlarge), resulting in a variety of effects. We finished more or less on time (everyone pitching in to help with the clean up of the ink and tools), but three of the participants stuck around afterwards long enough for me to give them a tour of our unique historic building. 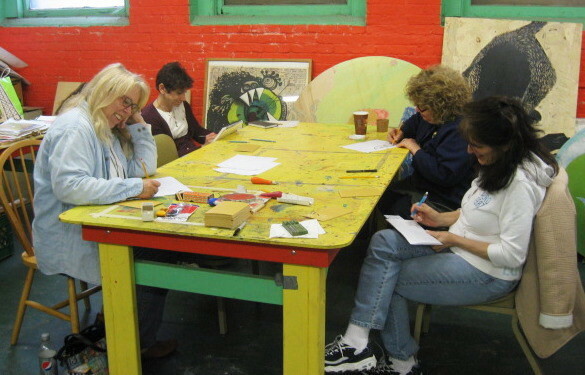 All four seemed to really enjoy the whole workshop, and indicate a plan to continue working with their cut blocks, as well as maybe making some new ones. Overall I think it was very successful, and would be happy to do another such workshop for the festival next year (planned as of now). We had a busy day in the Studio today. I arrived in the early afternoon to find Molly's friend still working away on her edition. Molly arrived shortly afterwards to photograph some of her past work for a potential customer. I wished Molly a happy anniversary, and after a moment of confusion she started throwing out possible occasions I could be talking about, none of which were right. Today is the 8th anniversary of an event that made this Studio possible, the day she and I met. The Southern Graphics Council decided to hold its annual conference at Rutgers in 2004. The SGC is an academic based group, so most of the attendees go at the expense of their colleges. I have no full time job (and thus no expense account), so I am not in the habit of going to these things. But with New Brunswick less than an hour away, the two biggest conference expenses (hotel and airfare) were eliminated from the equation, so I was on board. 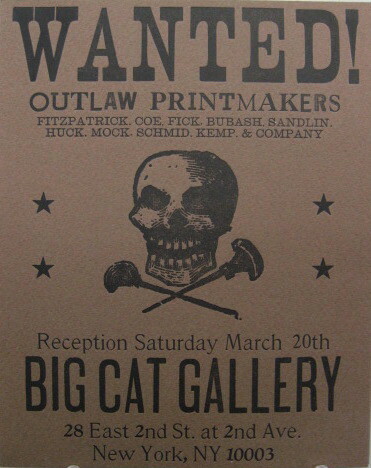 Even better, Tom Huck had put together a traveling group exhibition of the Outlaw Printmakers that would debut as one of the official conference events for the Saturday in New York City. So on that Saturday morning we all took a special charter train up to Penn Station, and had fun wandering the city until the scheduled opening at Big Cat Gallery in the afternoon. 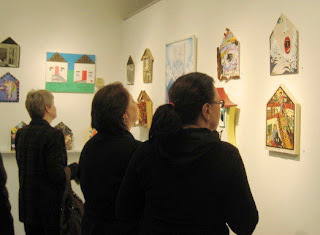 The show looked great, and we had a steady stream of visitors. At one point I overheard someone at the desk mention something about Manasquan, New Jersey, a relatively obscure topic in Manhattan, but a place I knew very well. I was using the basement of a family house in Manasquan as my studio space, and had plans to move into that house in a few weeks. The person talking to the gallery owner was Molly, and it turned out I wouldn't be the only printmaker living and working in town. In fact, once I completed my move, we'd be living only 7 blocks apart. 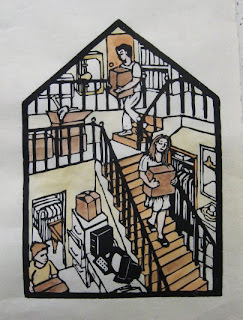 It would be a couple of more years before the circumstances that led Molly to want to rent studio space, and it's certainly possible we would have met through some other local arts connection, but the establishing of Studio Arrabbiata in Ocean Grove can be traced to that day eight years ago in NYC. After Molly finished her business there today she went on to her next stop of the day. Grace continued to work for a while until she finally finished her edition, some of which can be seen above. Besides being a printmaker, she's a chef in an Asbury Park restaurant, and took on the job of making a unique woodcut print menu for a special dinner event this week. 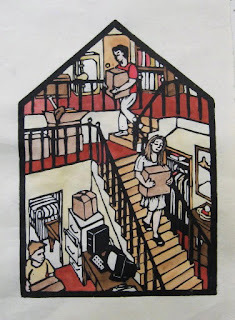 The multi-block print will be given to diners as part of the meal. She cleaned up her stuff and left the prints there to dry overnight. I had the space to myself for the rest of the afternoon, but I had things to do. One thing that I wanted to get done was to re-cover my bound copy of my Fourth of July series. Shortly after finishing the prints in 1994 I had made photocopies of the complete set and bound it into a book for convenience. Nothing fancy, a simple sewn and glued edge binding, and covers made from matboard and the whole thing covered with heavy colored drawing paper. I used metal type to print the name of the book on the cover. The structure has held up fine all these years, but the paper spine eventually wore out and started to break off. A few years ago I bought a piece of interesting paper at the former Pearl in Woodbridge, with plans to use it to make a new cover. Finally getting to that now. Since the binding was still strong, I decided to just glue the new paper over the old cover. 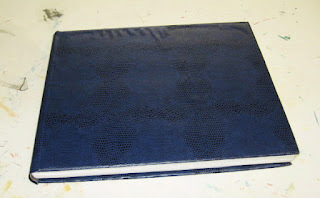 Shown above is the old book and the new cover cut to the necessary pattern. Above is the closed book with the new cover on it. Below is what it looks like open. I still need to redo the title page, but at least the book is in better condition when I bring it to my various classes over the next week or so. 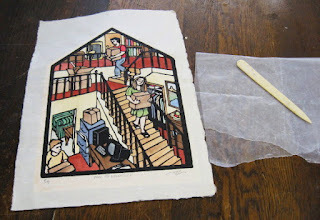 At the same time as I was working on the book I was also working on another wood mounted copy of the house print. (I went back and forth, working on one as glue dried on parts of the other) Did this one a little different than the first. I cut a piece of white paper to the exact size of the house image and glued it down to the shaped pine plank. 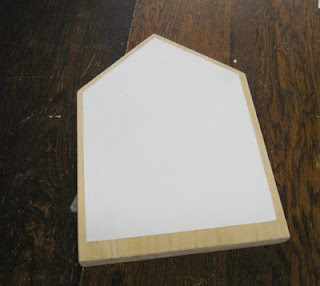 After the white paper had dried, I spread a thin layer of glue over the whole board, carefully lined up the print over the white paper, and glued it down, using a bone folder to smooth it out. After the print was completely dry I trimmed the extra paper and used sandpaper clean up the edges. The current state can be seen above and below. Eventually I'll put some kind of coating on it like I did for the first one. I packed up and headed home, ending another day at the Studio. The day wasn't over yet- I drove around the county and bought more things (art, hardware) that I'll need for the upcoming workshops. Tomorrow I need to make a few things, and start gathering everything together in one place. Another week of spring break right now, but I have plenty to keep me busy. I was in the Studio for a while today, getting ready for things coming up over the next few weeks. 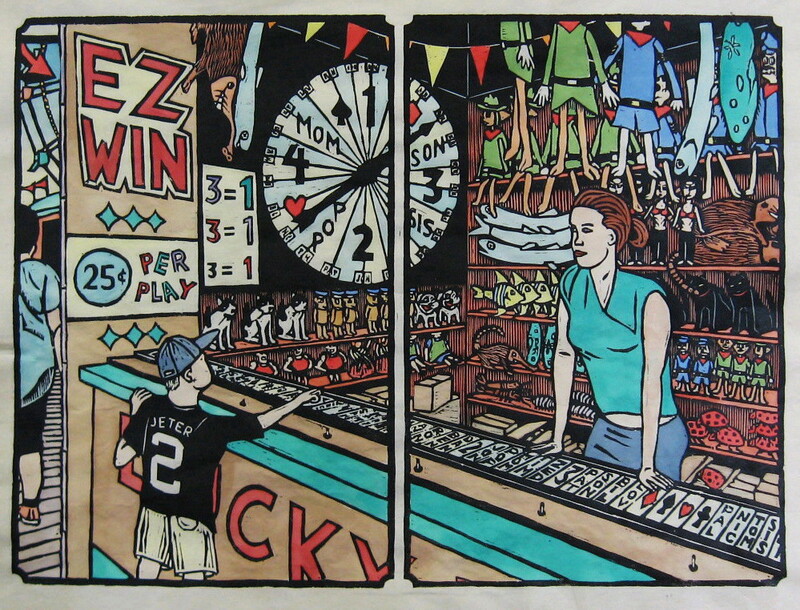 I unframed a boardwalk print so that I could replace it with another, to be one of my entries for the big annual show in Belmar. (still need to pick a second entry- not easy when I can't use the three dozen or so artworks I've shown there already) I had brought stuff with me to work on assembling a second mounted house print, everything except the shaped piece of wood, so that didn't get done. I ended up chatting a bit with a guest printer friend of Molly's, working on an edition due later this week. Turns out that she's recently become familiar with some of the Outlaw Printmakers, so I filled her in on some details of our adventures. From there I did a little shopping related to this weekend's workshop. The tools and inks that I ordered should arrive any day, but some stuff will come from local sources. 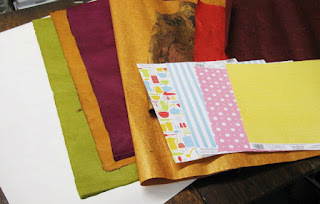 For example, today I picked up several sheets of scrapbooking paper in different colors and patterns, should my students want to try some collage processes. Plus things like pencils, markers, and paper towels- not special to linocut, but all useful. In addition to all that, today is St. Joseph's Day, where Italians celebrate their nation's patron saint, and as his is the patron of woodworkers, woodcut artists should also pay their respects. 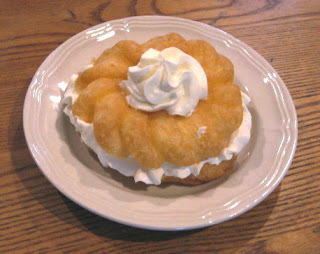 And since St Joseph is also the patron of dessert bakers, we celebrate with a pastry filled with some kind of cream. The photo above is from a previous year, filled with whipped cream, but this year I had a zeppole filled with cannoli cream, my favorite. Tomorrow- more of the same of everything, except the zeppoles. We're just about through the first weekend of the 2012 NCAA Men's Basketball Tournament. I started with three schools that I have an artistic history with, but now I'm down to just one- Syracuse. The team was on a lot of Final Four lists, and then just before the tournament began the school announced that its breakout star of the year would be ineligible the rest of the year. Suddenly they didn't seem like they deserved the #1 seeding they had received and might be an early exit. Still, they're a deep team and so far they are handling the competition. Things continue next Thursday. Having decided that I want to go forward for now with the most recent idea for the setting for the new boardwalk print, the next step was to do more research. Forecasters say we are entering another stretch of unseasonably warm weather, but rather than take a chance on what may happen, I went back to Asbury's boardwalk today. It was warm and sunny when I left my car at the Studio, but not as nice when I got to the Ocean. Chilly, cloudy, stiff breezes. Passing through the Casino, I couldn't even see Convention Hall through the fog, but I'd be drawing it from up close, so that wouldn't be an issue. I had brought some drawing paper with me, pre-lined with the border size for prints in this series, and a old canvas board to act as a portable work surface. I wanted to make the two bits of architecture on either side feel much bigger than in last week's photo, to provide a sense of them looming far overhead of the viewer. At the size I drew each building today there was no space between them, so I will have to play around with spacing and scale on the next version. 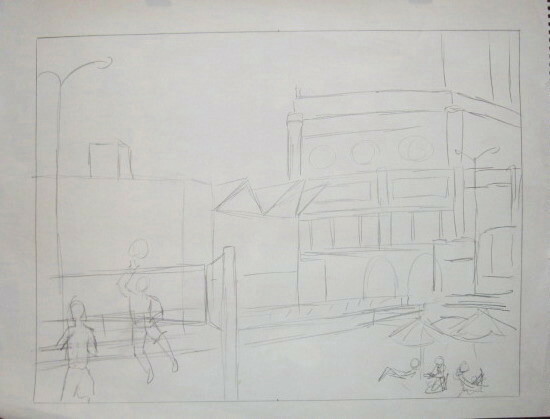 I also took a bunch more photos of the two buildings, to give me more details to use in the eventual block sketch. I think that I have enough to get started, though I can always go back again if I need to. On the way back I scouted some locations that I need to to know for next weekend's arts festival in Ocean Grove. Somehow, as soon as I reached my car, the sun finally came back out, after having been missing for the 90 minutes I was wandering around. 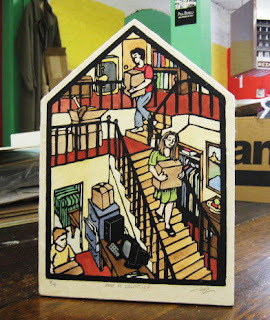 I still want to mount another copy of my house print onto a shaped block of wood (like the one currently hanging in Belmar), but the piece is done, so it's time to get going on a new print. 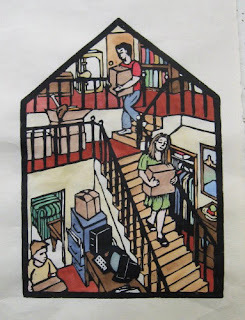 Actually this isn't completely new, but the one I had been starting to work on when I put it off to take on the house project. It's the next planned boardwalk print, a general daytime scene, and I decided to try setting it specifically in Asbury Park for various reasons. To have something to show at the January crit group I had knocked out the above sketch in about 10 minutes, based on some photos I had taken days before and some collected reference materials. It got a positive response, but I wasn't sure that it was the answer. It's an effective composition, and certainly locates the scene in Asbury, and it gives opportunities to feature people on the beach. However, the boardwalk itself would be too small to differentiate any of the figures on it. Now that there's time to work on it again, I decided to explore other options. We're in the midst of a late winter warm spell, sunny, almost 70 degrees. A good day to gather some more research. 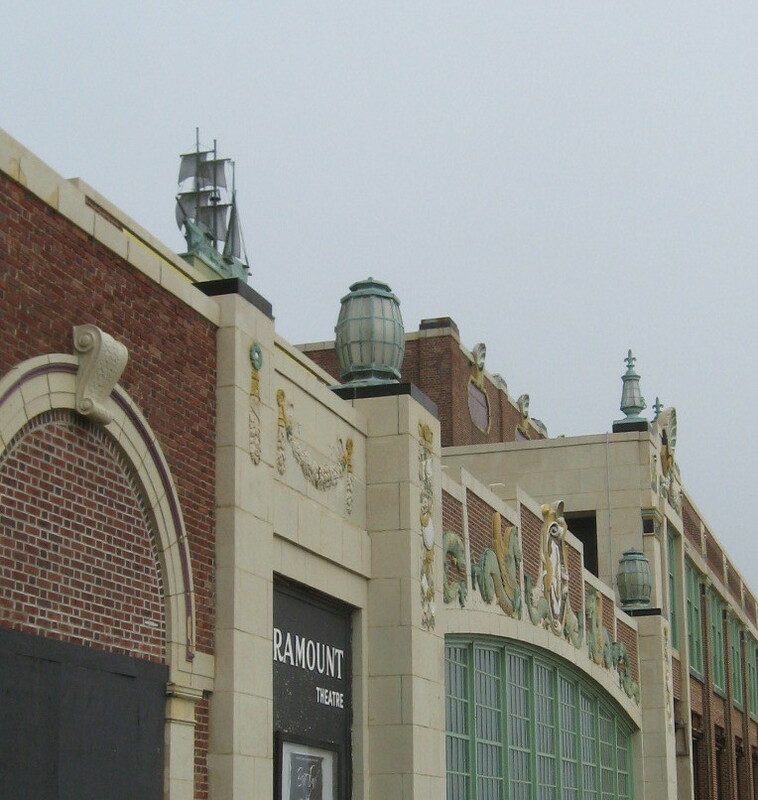 I parked at the Studio, and walked up to the Asbury boardwalk, up toward Convention Hall. I wanted to explore the opposite of the previous sketch- a view looking from the Boardwalk out toward the ocean. This would emphasize the people on the boards, but we could still get an indication of sunbathers and volleyball players on the sand. I could include the part of Convention Hall that extends out toward the water, recognizable to anyone from the area. The above composite photo was taken today and shows what I was thinking. My biggest issue with this is that scene is somewhat unbalanced with the building on one side, and it gives us a whole lot of empty space across the upper half of the composition. On a whim, I decided to walk toward the street end of Convention Hall, if only because I had never bothered to walk that way before. Nothing too exciting, but then I looked back toward the beach. From my position I had Convention Hall just to my left, and off to the right was the old Howard Johnson's. The two buildings form a frame left and right, and unusual light posts occupy positions in between, breaking up some of the sky. The composite photo above gives some idea of the scene. I think this could work well. I would have to play around with proportions and such, and actually go back and do some sketching to get a sense of how the buildings loom overhead, but this idea has moved into the lead. Every year it is my custom on Selection Sunday to note which of the schools (68 in the current format) I have an artistic connection to. Sadly, only three this year, all of which are seeded in the East Region. In numerical order, they are Syracuse (#1), Texas (#11), and Harvard (#12). The first two were locations of print exhibitions that I was part of, while Harvard is the location of the Fogg Art Museum, which purchased one of my saints for its collection back in the 90's. Syracuse was a top team this year, and has a realistic shot of making the Final Four, if not winning the championship. I expect that I have a bunch of school connections to colleges in the NIT, but people just don't care about that. Last week we had one of those rare 5th Wednesday drawing groups, and I was there to take care of some business, but I did not draw. Today we're back to our usual schedule, so I had my easel, pad, and charcoal and was ready to go. I prefer a variety of medium length poses, but lately the group as a whole wants one long pose for the whole session, so that's what we've been doing. My solution is to move to another part of the room about halfway through the evening. My first drawing was from right in front of the model, she facing my position. I didn't do a bad job with the challenge of her nose pointing right at me, but I messed up the eyes, and no amount of fussing around could save them. 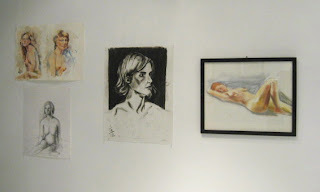 For the second drawing (above) I moved about 10 feet to the left, getting more of a 3/4 view. It's not the best likeness I've ever done of this model, but at least the 45 minute drawing looks like a believable human, and it's much better than either drawing from my last time there. (top row) Molly's sketches, my just completed house print, and Tim's watercolor sketches, (middle row) Harriet's watercolor, (on the floor) Robin's collage postcards, Sheilagh's box sculpture, TJ's painting, Mary's painting and cray-pas sketch. Not shown- small paintings from Ellen. After we looked at all the art in the Studio, the group moved down to the annex, our name for the hallway and area just in front of the kitchen, and the place where larger art is usually set up. First up was Vince and a series of color pastel grids and squares. Still not determined...which came first- Vince's squares or Ellen's handbag (below). Adam brought a couple of tall sculptures like the one above, featuring pieces of vinyl siding deformed by the heat of a house fire. 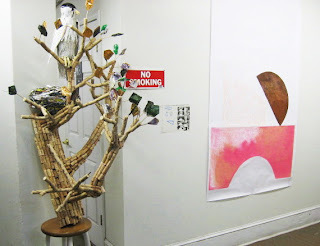 Also in the annex were Molly's large geometric drawings, and Lisa's sculpture of a cork tree with plastic hawk in the branches. My piece received many positive comments. People liked the large deep space created in the scene, and that while it's obvious that's there's a narrative, it's open enough for the viewer to come up with an interpretation. Some thought that there were definitely messages to be found, other than my downsizing/moving story. Molly particularly liked the everyday quality of the characters. 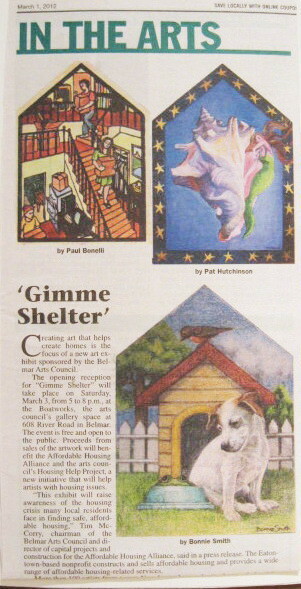 Today was the opening reception for the Gimme Shelter exhibition at the Boatworks in Belmar. All the effort of the past month or so to get my house piece done was for this show. 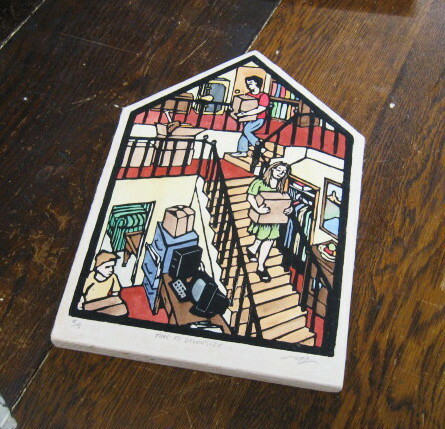 Shown above is how it looked on the wall. Below, a group of people checking out my artwork. Had a little surprise when I got there- I was shown that my art was reproduced in a local weekly paper in an article promoting the exhibition. I'll see if I can pick up a copy early next week (not distributed in my immediate area), but until then I have this photo I took of the clipping at the gallery. 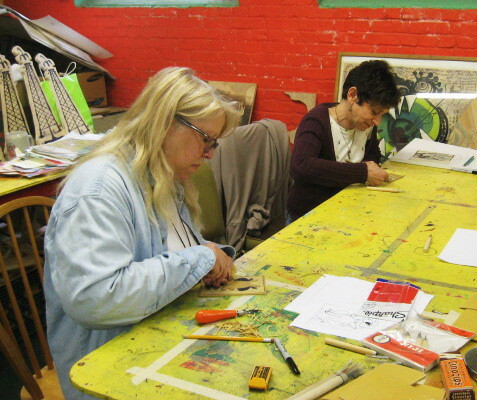 In the back room of the Boatworks were about 2 dozen works done in various recent classes and workshops. 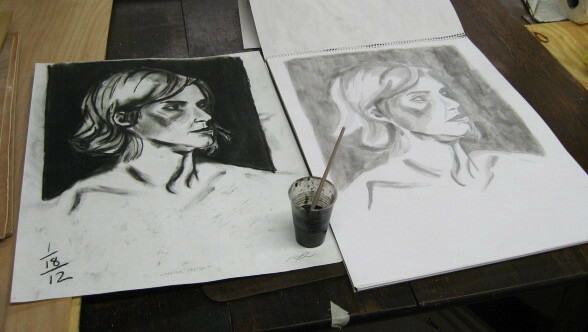 The charcoal portrait that I brought back last Wednesday sat right in the middle of other drawings from our figure group. Plenty more images from the show can be found over on the BAC blog. The show will be up through March 23rd. I had a couple of hours available in the afternoon to get into the Studio and work on coloring the most recent proof of my house block. Below are various states of the proof. The first level of coloring included all the yellows, and light and medium brown colors. The next step was to add dark browns and different kinds of reds. The last thing that I got to today was some of the cool colors- blues and greens. If not for the time spent waiting for parts of the print to dry, I might have been able to finish it all, but I had to get down to Belmar for an opening. So the last bits, various grays, will wait for another day.